When I’m trying to be cool talking about my intersession I tell people I was visiting friends who are doing a gap year in the Capitol (which is technically true), but mostly I was hanging out with my aunt and going to art galleries. On the first day of my stay in D.C., we drove to the National Gallery. At some point during the visit my aunt took a breather in a room full of Rembrandts and I took a loop through the rest of the Dutch Golden Agers in the section. Some famous still lifes here, a few portraits there, dams and canals over that-a-way. Ultimately I came to probably the second most well-known Dutch guy there, Vermeer. The painting that immediately caught my attention was Woman Holding a Balance, if only because I had seen it about a thousand times on the cover of my art history textbook senior year of high school. It’s a nice painting, and lends itself to analysis; the lady is pregnant and she’s holding a balance representing the weighing of her soul and her child’s, a theme that’s accentuated by the Last Judgment in the background and the light (probably representing the Holy Spirit) shining down on her through the window. Open and shut case. As a result of this painting’s easy interpretability, the painting next to it devastated me with its weirdness. 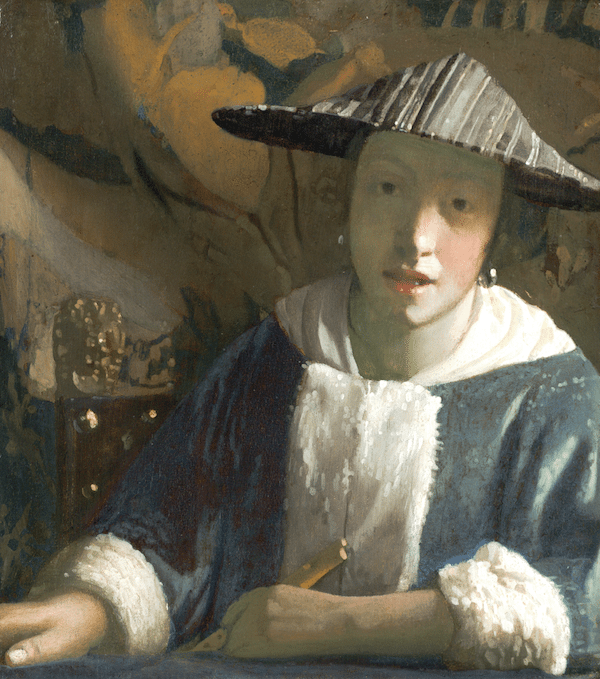 Girl with a Flute, attributed to Vermeer, remains a mystery even to people who actually study this stuff. It is smaller than the adjacent “actual” Vermeer and almost square, about 7-by-8 inches, unusual dimensions for a portrait. The next bit that caught my eye was how the girl stares directly at the viewer. There is no coyness, no three-quarter perspective. This girl just straight-on, full-face ogles you. It doesn’t help that her mouth is slightly open, and that her face is so smooth and featureless as to make me question her humanity, or at least whether or not she belongs more in an early Pixar movie than a Dutch master’s painting. She’s dressed up sort of like one of the Ice Climbers, in a blue coat trimmed with white fur and a conical hat I’m going to assume was popular at the time, possibly introduced through Oriental trade lines. She holds her titular flute at the bottom edge of the portrait, perhaps as an afterthought. Because she’s there to stare at you. In my state of mind, fresh off a train and far away from academic inquiry, this mystery was almost a personal affront. How dare it be so weird? How dare flute-girl stare at me? At the same time, I can see why this painting might be attributed to Vermeer. There’s no question that the coat is gorgeously textured and reasonably well-lit, and the face is almost as serene and idealized as one of his textbook portraits. The straightforward look is not unlike that of Girl with a Pearl Earring, it just lacks all slyness and specificity. It could be a moderately insane person aping Vermeer, or a drunken/unfinished experiment by the actual artist. It’s almost genius in its strangeness, as if someone aborted a decent imitation just to confuse historians. In this respect, it’s the background that kills me. Is she in a brownish yellowish tent? Is the world behind her composed entirely of smoke? I’m pretty sure there’s a dresser in the lower-left corner, which is a detail Vermeer might put in as part of his domestic motif. But it’s blurry and ill defined, painted with brushstrokes that, like those in the background and the girl’s face, belong to a painting by Post-Impressionists more than they do to one by a Dutch master. The background, in color and composition, reminds me of the Last Judgment mini-painting in Woman Holding a Balance, just in its vague yellow-and-brown suggestion of apocalypse (an impression created here by a few diagonal lines and curving shapes). If you’re willing to jump the shark with me here, my conspiracy theory is that this is the daughter of Woman Holding a Balance, and as a result of her mother’s sin her daughter is now trapped in the Last Judgment painting, cursed to an eternity of botched brushstrokes and weird alien faces and playing the flute, which isn’t as good as the fiddle. Or maybe the guy just didn’t finish. Jeez. If you want to read about how actual art professionals think this painting is weird, feel free to look up the piece at the National Gallery Website, where they confirm with scholarship what I mostly got by guesswork. Initially I thought the girl with the flute might be the guy that came over with the wallpaper samples and Johannes had him model the Chinese hat. But the girl in the red hat has the same face (borders on soppy) so that weakened that idea. I was taken aback by the size of this piece – 8 by 7 inches basically, which I find bloody small – been dabbling in oils recently and producing that sized image with this range of light values is remarkable. Maybe the Guilds had regulations forcing Vermeer to go small or possibly it was someone’s mistress and it had to be easily hidden…..layers of questions, Bam.